It’s all about the tool: the flat, wire grater my grandmother Martha used to grate the potatoes and onions for her potato kugel. There’s just no making it right without that tool. Sure, you can make a fine kugel with your standard potato grater, or even with a food processor. If you make it that way, you won’t be disappointed, but once you’ve had it made with the wire grater, there’s just no going back. Unfortunately, I didn’t own the tool for a long time. Nor, in fact, the kugel recipe. The kugel was one of those things that grandma (in possession of the original grater) made. When she no longer was able, my mother or an aunt would step in. In time, the grater and the recipe fell to my generation. My sister became the keeper of both, and she’d transport them to my house for the the holidays when we wanted the kugel. I was happy for my sister to have the grater. It made sense. She was so close to my mom. It seemed a natural path of inheritance. But I wanted to be able to make that darn kugel myself. Whenever I wanted. I live in a lovely place, but you don’t visit this area for its shopping (unless you have a hankering to visit the King Arthur Flour store, of course). No one around here seems to know about the wire grater. But, by gum, the World Wide Web sure knows about it, and when it (finally!) dawned on me that I could order one online, I had the thing in my hand a week later. And the recipe soon after. When the Lets’s Lunch group decided that this month’s challenge was to make a holiday side dish from our family or culture, I knew it would come down to either latkes or the potato kugel. After all, what’s a Jewish holiday without some form of potato cooked in oil? And if the recipe requires using a tool where you’re sure to shave some skin off a knuckle, all the better. The potato kugel is very similar to potato latkes (rendered so ably by fellow Let’s Luncher Lisa, aka @MMCCchikie). Its brief ingredient list yields a rich, irresistible, and festive holiday treat. The process of making the two recipes begins identically: grate the potatoes and onions, squeeze out the extra liquid, add a little flour (or matzoh meal during Passover), some salt (and pepper if you like), a couple eggs, and mix. For latkes, you’d form patties out of the mixture and then fry them in oil until golden. For the kugel, you add the oil to an oven-proof pan, then add the mixture to the pan, and bake it until the oil is absorbed and the kugel is golden brown. If you’re a traditionalist, serve the kugel with some apple sauce. You won’t be unhappy. For an extra treat, though, serve it the way we ate it this evening, topped with sauteed mushrooms. It’ll taste so good, you won’t even notice your scraped knuckles. Want to find out how the rest of the Let’s Luncher are celebrating their holidays? Check out Cheryl’s post (Auntie Jane’s Potato Gratin), where she rounds up all the Let’s Lunch posts in one place. If you want to join us for the January’s challenge (still to be determined), just follow the #letslunch tag in Twitter. Peel the potatoes and onions, then finely grate them into a large bowl, alternating the potatoes and onions to keep the potatoes from browning. 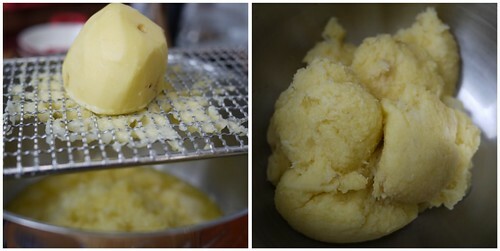 Squeeze the potato and onion mixture through cheesecloth to remove most, but not all, of the moisture. 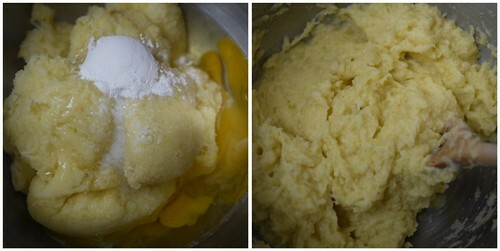 Return the mixture to the bowl. Add the flour (or matzoh meal), salt, and eggs to the mixture, then stir to thoroughly combine. Pour enough oil into a 9″ x 13″ baking dish to cover the bottom of the dish with 1/8″ of oil. Heat the pan in the pre-heated oven for about 15 minutes. Remove the pan from the oven and test the oil to make sure it’s hot enough by placing a small spoonful of the potato mixture in the oil. If it bubbles, it’s hot enough. If it’s not hot enough, return the pan to the oven for another five minutes, then test it again. When the oil is hot, spoon the potato mixture into the hot pan, pressing the mixture flat on top and into the sides and corners of the pan. The oil will rise up on the sides of the pan. With a spoon, collect the oil from the corners and sides, and then drizzle it across the top of the potato mixture to evenly distribute the oil. Bake until the top is golden brown and crispy. Depending on the size of your pan, the depth of the kugel, and the amount of oil you used, the kugel may be done in just an hour-and-a-half, or may take as long as three hours. Check at 1 1/2 hours to make sure it’s not browning too quickly, then continue to cook until it’s as brown as you like. 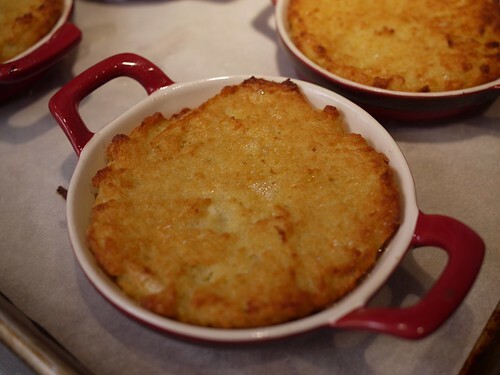 Note: You can also bake the kugel in individual ramekins or baking dishes. Follow the same instructions for preparing the potato mixture, add a bit less oil to each baking dish, and then divide the mixture evenly among the baking dishes. If you use small dishes, the baking time will be dramatically reduced. I made a half batch of the mixture and divided it among four 4″-diameter dishes. The kugel was baked perfectly in just one hour. You know, I’ve never had kugel!? Love your humor Rebecca! My knuckles always get scraped. I did not have a wire grater, but I do have a six-cup measuring bowl made by tupperware in the 70s that I have to have in order to make biscuits. No six-cup measuring bowl, no biscuits. Or at least not any that are gonna turn out all that well. So glad you now have your own gotta-have kitchen tool for kugel! Exactly! Some recipes just require the tool and no substitutes will do. I am hoping I can redeem myself over the Martha Kugel after failing at the Martha Pickles. I need to get that tool, though, right? Did I miss where to order that? This looks delicious, love the little bowls you have to bake it in, those are so pretty. Now this works for breakfast, lunch, and dinner, right? Good, I thought so. Thank you for the recipe, I feel honored ALWAYS to get a family recipe. Yes, you definitely need the tool, Kayte! 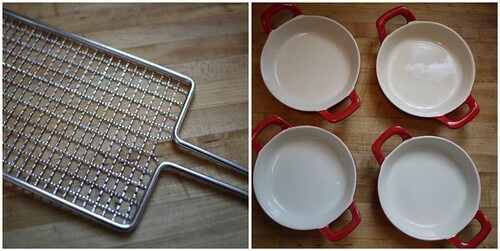 You can find it all over the web by searching for “flat wire grater”. For example, here’s one place: http://fantes.com/graters.html (scroll down until you get to “stainless steel safety grater”. Can’t wait to hear how the recipe works for you. If you have any trouble, let me know and I’ll see if I can make the recipe clearer. I’ve never seen a grater like that — I can see how it would contribute a distinctive texture to the dish! Your kugel sounds like great winter eating! I want one of those special potato kugel graters, too! That has to be the secret to getting the perfect texture…looks fabulous. It does make the perfect texture. I’m thinking of trying it on some latkes this year, too.